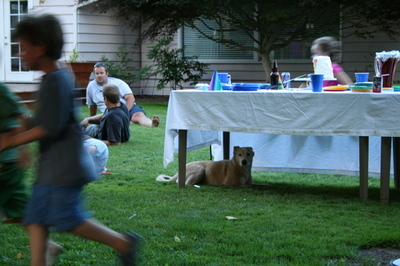 Too tired to say much, but I wanted to at least post some photos of tonight's rainbow birthday party for Bo. It was pretty chaotic, so it was hard to get great pictures, but she had a ball. Thanks, everyone, for putting up with all the rainbow crafts over the last few weeks. What a wonderful blog and congrats on being a TypePad featured blog. I love that cake! Very clever. Holy Cow, what a CAKE! My daughter would flip. Happy to hear of the party success! thanks so much, guys. It was a hoot. She was soooo excited all day and was just bursting by the time everyone arrived. 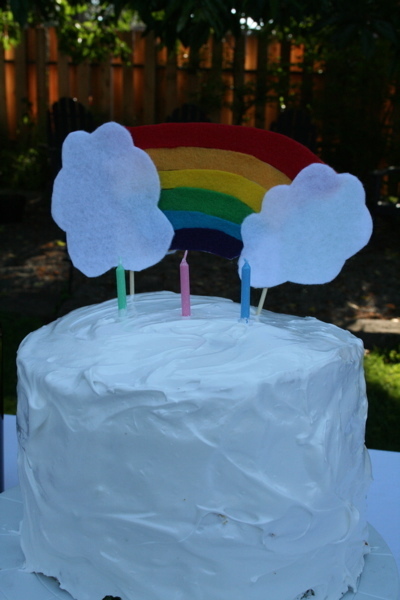 My purple layer looked more gray than anything, though, so ours was an abbreviated rainbow. Fun! Looks like a party dreams are made of. The cake Wow-ed me the most too! Impressive. 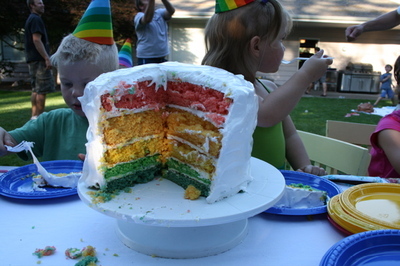 But the rainbow hats, plates and knapkins were a great touch too. 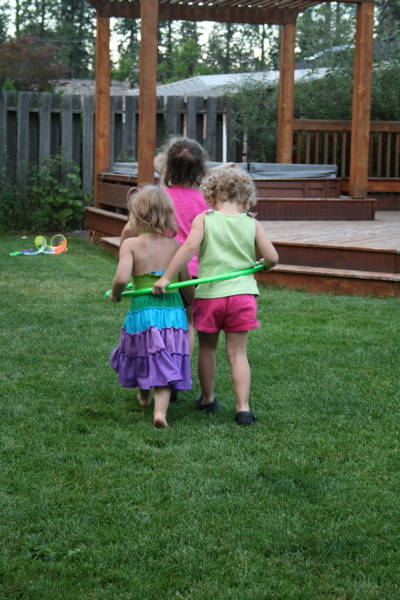 I also love the pic with the girls in the hula hoop - was that a game, or were they just playing independently? 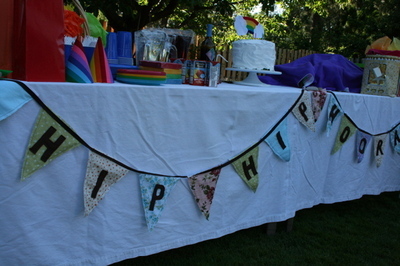 Oh, it really was a pretty simple affair with a few crazy rainbow touches. We have a great group of close-knit friends who could get together in a cardboard box and still have a good time. The hoola hoop hustle you see there was totally spontaneous. What you don't see is what happened 30 seconds later when the girls ran onto the deck and then the oldest girl in the lead there ran the two little ones off the deck without pausing to let them catch their footing. "I tough. I tough," said my daughter. Thanks, Andrea. Right back at ya.